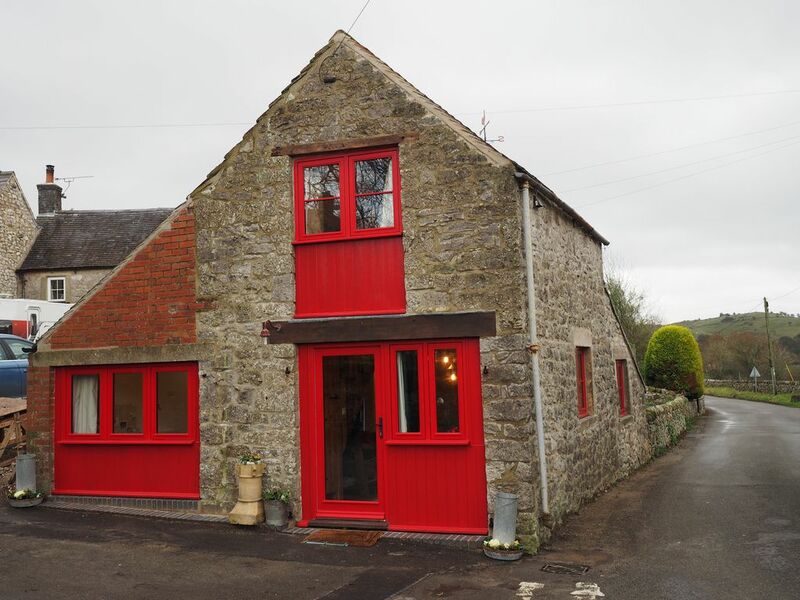 The Old Co-Op Barn newly converted in Dec 2016 oozes warmth, charm and eccentricities. Soon to be shown on Chanel 4 new renovation show “Big House Little House” 4pm on saturdays in April. See the renovation from the beginning of the project to the end!! We hope you like it, it was fun taking part. The Barn is very special and everyone loves the unique character. You will see dustbin lids, potato baskets and ladders used as light fittings, old sacks, and picnic blankets for curtains. John made the kitchen from used pallets delivered to site during the renovations, Vanessa painted them to look like a garden potting shed. There are many more surprises, such as the double ended bath in the upstairs bedroom. The main bedroom upstairs is a beautiful room with double aspect windows with filed views. The luxury double ended bath is just what you need for a long relaxing soak. As a special romantic touch the bath is at one end of the bedroom! There is an en-suite loo and washbasin tucked away off the main bedroom. The twin-bedded room is on the ground floor with en suite large shower, toilet, and basin. With two full sized single beds and has relatively easy access to suit less able guests who find stairs a challenge. Also, ideal for children, friends, and relatives. The fully equipped kitchen has everything you need to cook your own meals if you want to stay in. There is a full set of crockery, cutlery, and kitchen utensils to suit four guests plus plastic dishes and cups for one child. The kitchen has a full range of appliances; electric hob, full sized electric oven, microwave, fridge, dishwasher and washing machine. Choose the Barn to enjoy home from home comforts blended with traditional style and exciting design. Enjoy your break and let your imagination go. You will get plenty of ideas to take home with you. Photos are free; help yourself! Pets are welcome both in the barn and at The Olde Gate Inn is just a short stroll down the lane. It has open fires, great food, good beer, and a warm welcome. Some practical stuff now: The Barn has free dedicated wi-fi and the broadband service is good. There is a colour flat screen tv with a free sat service and a dvd together with a collection of dvd’s. There is also a radio, cd player with a phone music connection. Full oil fired central heating; all included in the price. Wood Burning stove with free kindling and logs for your first night. Bring some news paper! We run out! Clearview traditional Wood Burning Stove. Logs and kindling sticks for your first night provided. small selection...feel free to swap! Enclosed with decking area, the garden has open views, garden table and chairs. Lock up security rings for bike safety. Well located and stocked for a few nights in the area. An interestingly furnished and finished home. We had a very nice long weekend with a couple of friends. The cottage is very well thought out with some clever design features. We would certainly consider using it again if we need to stay in the area. An ideal base for a weekend of exploring. The cottage is packed full of querky features making this property individual and interesting. Fully equipped with everything you need. Living area and upstairs bedroom somewhat small but functional. 2 lovely pubs within the village both offering a friendly welcome. Would definitely recommend for anyone looking for a quiet retreat surrounded by beautiful countryside. We had an enjoyable long weekend in this cosy cottage. Loads of walking from the door with an amazing bath and a fantastic log burner to return to on a snowy winter's day. The break was perfect from start to finish. The cottage is wonderful with lots of quirky features, we loved the bath in the bedroom. We went for some excellent walks straight from the cottage in addition to a couple bike rides. John and Vanessa couldn't do enough for us - they are such a friendly couple. We had brilliant meal at The Olde Gate Inn at a very reasonable price. I cannot recommend this gorgeous holiday cottage enough. If you spot a two night short break that is free on the calendar...get in touch and we will try to help you. If we have an orphan day between bookings we will offer it at a discount to both parties on first come first served basis. Rates are subject to change until reservation is confirmed.